Leave it to Kathryne to buy more facial oils. I just can’t get enough, OK?! My skin is having a renaissance! Peter Thomas Roth Oilless Oil 100% Purified Squalane ($38 for 1 oz.) caught my eye while I was researching facial oils because it uses the word “oilless” in its name. How can an oil be oilless? What is happening? Stay with me here…Peter Thomas Roth squalane is preservative free and derived from farmed, naturally sourced sustainable sugarcane. Did you know squalane traditionally is sourced from shark liver? Yuck, we certainly don’t feel like a shark needs to die for our beauty regimen…especially if there are plant-based alternatives (like derivatives of sugarcane and olives). Let me tell you why you should be putting this souped up candy onto your face: squalane is very light. It mimics the naturally occurring squalane found in the human body. By doing this, it helps prevent water loss, so you don’t need to reapply. You’re good on this all day! And unlike heavier facial oils, it absorbs very quickly. Probably because it isn’t actually an oil, per se. It looks like an oil, feels like an oil, and hydrates like our favorite facial oils – but it doesn’t sit on your face or leave any residue. THIS is the product that you can put makeup over, people! It’s the perfect product to smooth your face out, fight fine lines during the day, and keep your skin nice and moisturized. I recommend this oil for all skin types. It is mild, odorless and colorless. The little eye dropper is so perfect for application: just a few drops, maybe three or four, and your whole face and neck are taken care of. It even works well on rough spots like elbows, knees, heels, cuticles and split ends…although, I like to use my less expensive oils for those kind of things, like organic coconut oil or vitamin E.
To reiterate, this is a one ingredient product! The thing that I love about pure facial oils (and…”oilless” oils) is that they’re simple and concentrated, especially compared to traditional beauty counter creams padded with fillers and chock full of nasty toxins. The less ingredients, for me, the better. My skin has never felt healthier than in the past few months of rotating facial oils in and out. The TODAY Show recently did a segment on this product, so it’s receiving a whole lot of love. I am super happy that products like this are getting the national TV treatment. 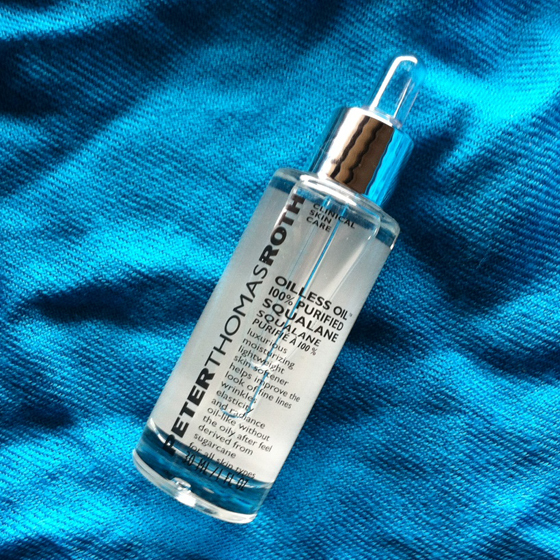 While Peter Thomas Roth’s whole line of products is NOT 100% natural, this one is. Keep being your own best friend and read those ingredient lists like a hawk, girl! What are your favorite facial oils? Do you use different oils in the morning vs. at night? Had NO idea you could get squalene from sugarcane…you learn something everyday! I know, this blew my mind too- it’s been a nice change from the heavier oils I have been accustomed to like the coconut! I love them all equally, but this one is definitely on the rotation now. Funny, too how after a few months of use, my face has adjusted to the facial oils. I remember the first time I used one- going out into public with make up over it feeling like a glistening baked Christmas ham… not now though! I’m never going back!